And so the pages of the calendar flip ahead to 2017. While looking ahead to the very many possibilities the next 365 days have to offer us, it's also important to look back and reflect on the year that has just gone by. 2016 hasn't been too bad for Indians in motorsport. Gaurav Gill's gone and won his second Asia-Pacific Rally Championship title. 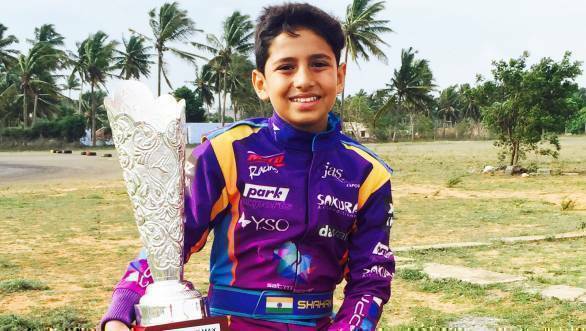 Young Shahan Ali Mohsin's claimed the title in the Micro Max category of the Asia Max Karting Championship. Armaan Ebrahim's won the Pro-Am title at the Lamborghini Super Trofeo Asia Championship. Karthik Tharani's been to Laguna Seca as part of the Mazda Road to Indy Shootout. Sachin Chaudhury, after just his first season of racing, went to Spain having been granted entry to the Red Bull Road to Rookies Cup 2016. Closer home, the APRC season finale was held successfully in Chikmagalur. And IndiKarting began organising a new grassroots-level karting championship. Just a few examples of the many things that have happened over the year. It's been a mixed bag of success, opportunities and learning. But perhaps it's the learning that's the most significant. It's the learning that ensures that we make the most of the opportunities that we get. It's the learning that ensures that we move further on the path to success. And it's the learning that sees to it that we don't let failure bog us down. It makes us strive forth and forge on no matter what. Which is why I am particularly pleased that as you read this, and as we head into 2017, unsure of what lies ahead, there are two Indian riders - CS Santosh and KP Aravind - braving the treacherous sands of the Dakar, making use of the opportunities that they've been given, and the years of learning behind them. To me, it's a sign of how hard work and long sought-after dreams can be attained. How opportunities do crop up, completely out of the blue, when something is wished for strong enough. But it's also a lesson in preparation. In doing absolutely everything that is humanly possible to ensure that when the opportunity does come along, you're able to do it justice. To ensure that you have no excuses. And to also ensure that you have no need for excuses. That you're able to progress, even if it's just a little, towards your goals. After all, we've all got goals. Some of us have clearly defined goals. We look at them as we'd look at the corners of a racetrack. We calculate the speed at which to approach them, the way we must attack them, and once tackled, we quickly look on ahead to the next corner. The next goal. Some of us have goals that are so tricky, they need pages and pages of pacenotes to help us tackle them. To ensure that we are prepared for any eventuality. For the very many things that the universe might throw our way. For unexpected rain, for faulty equipment, for rocks and boulders that might land in our path. It's impossible to tell what lies ahead. But it's possible to be prepared, and to make use of the many life lessons we've amassed along the way. Which brings me to this. Over the course of my time as a writer, I've learned my fair share of lessons. Not just lessons in fact checking, research, proofreading, and the art of sentence construction, but a few life lessons here and there that have been taught to me by wise people I've chanced upon. I've learned that there's really no goal that's insurmountable. That if a task requires 100 per cent effort, and you aim to put in 120 per cent effort, you'll usually get the job done pretty darned well with even 95 per cent of the effort. But aim high and don't leave any stone unturned along the way. I've learned that worst-case scenarios don't usually come true. That if you're honestly trying to make a choice, a choice that will cause nobody intentional harm, then things almost always turn out just fine. Of course, thinking through every possible outcome helps. And I've also learnt that whenever you decide to do something, to say something, to strive for something, you must always be right. And being right takes hard work, effort, courage and growth. And so for 2017, I wish you the strength to learn, the courage to decide, the determination to grow, and the irrepressible willingness to always hope and dream. After all, it's a brand new year. It's full of pages yet to be read, words yet to be written, laps yet to be driven, tiny milestones yet to be passed and chequered flags yet to be crossed. It's a brand new year. Complete with unexpected twists and turns in the road yet to be chanced upon, paths forking left and right yet to be traversed, bends in the road yet to be turned, crests and troughs yet to be ridden. It's a brand new year. With unexpected victories yet to be claimed, terrible losses yet to be borne, that too-strong rival yet to be bowed down to, the occasional close finish yet to be cherished. It's a brand new year.